21, 22 y 23 de Mayo de 2014. 1. Teacher Certificate in the AO Operating Room Personnel Course 14th-15th March of 2012 in Madrid. 2. 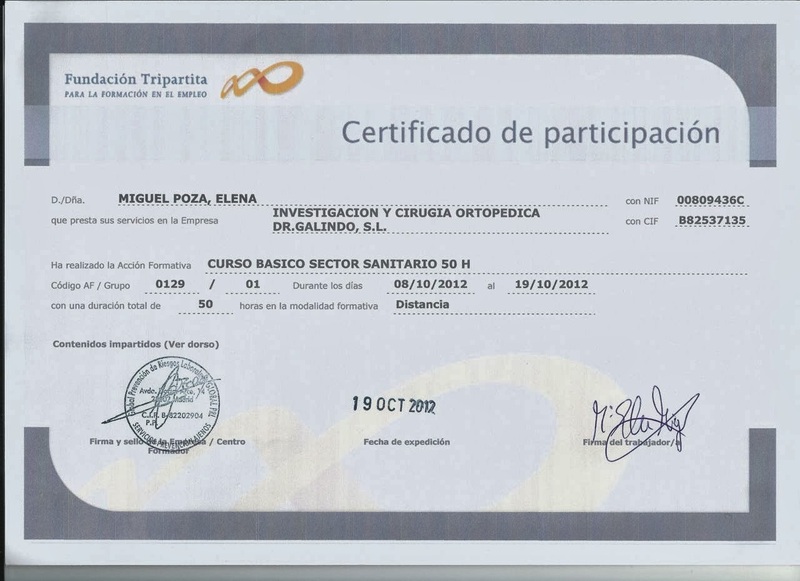 Certificate of participant in the Basic Course in prevention of occupational risks in the health sector (50 hours) October 2012. 3. 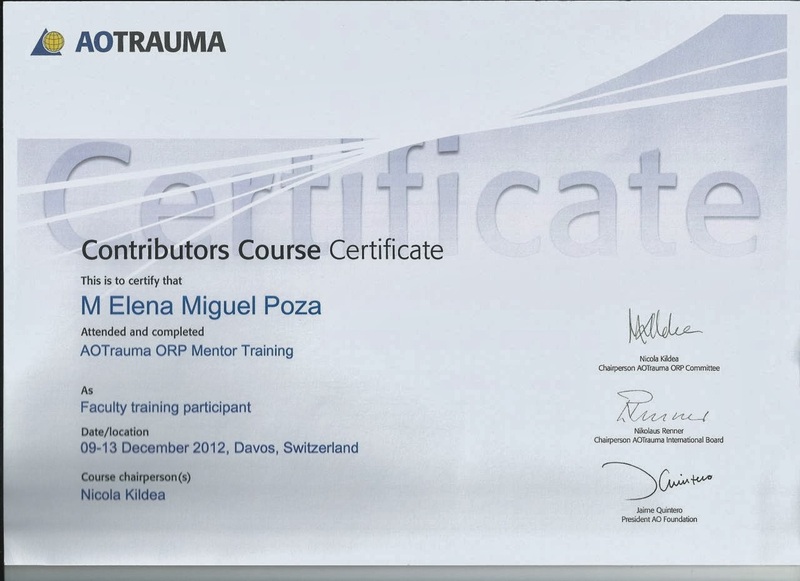 Faculty training participant Certificate of the AO Trauma Operating Room Personnel Mentor Training. 9th -13rd December 2012. 6. 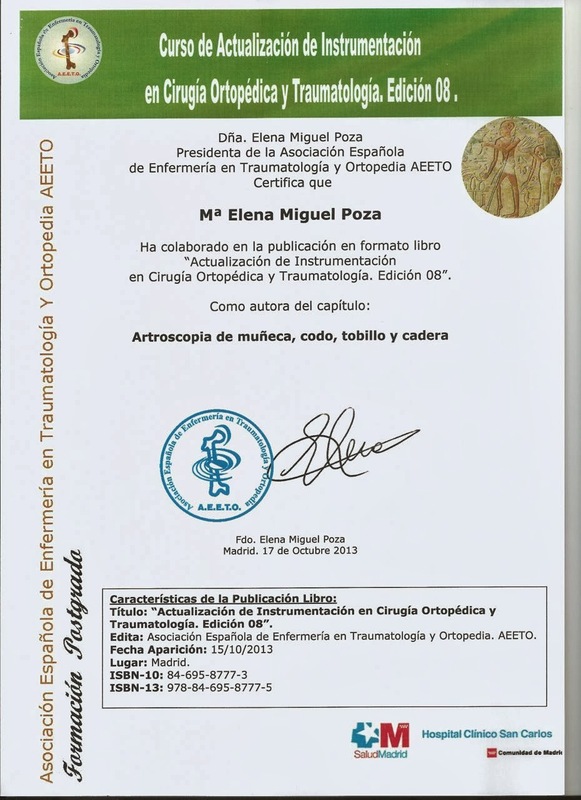 Publication certificate in the book of IX Basic Course for Operating Room Nurses in Traumatology and Orthopaedic Surgery (AEETO). 7. 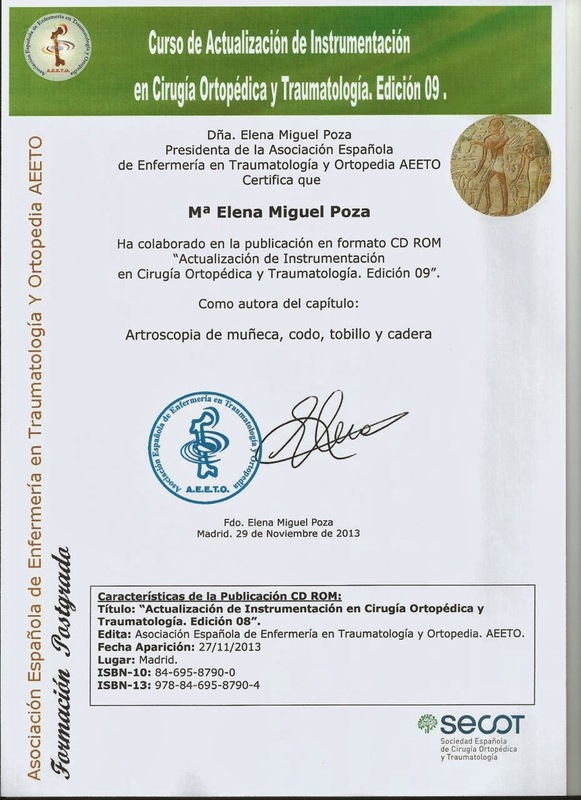 Publication certificate in the CD of IX Basic Course for Operating Room Nurses in Traumatology and Orthopaedic Surgery (AEETO). 8. President Organizing Comitee of the XII National Congress of Spanish Traumatology and Orthopaedic Nursing Association - Asociación Española de Enfermeria en Traumatología y Ortopedia AEETO. 24th – 26th April 2013 in Toledo. 9. Teacher coordinator Certificate in the VIII Update Course for Operating Room Nurses in Traumatology and Orthopaedic Surgery, in Hosp Clinico San Carlos organized by Spanish Traumatology and Orthopaedic Nursing Association- Asociación Española de Enfermeria en Traumatología y Ortopedia AEETO. 15th – 17th October 2013. 10. Teacher Certificate in the VIII Update Course for Operating Room Nurses in Traumatology and Orthopaedic Surgery, in Hosp Clinico San Carlos organized by Spanish Traumatology and Orthopaedic Nursing Association- Asociación Española de Enfermeria en Traumatología y Ortopedia AEETO. 15th – 17th October 2013. 11. Publication certificate in the book of VIII Update Course for Operating Room Nurses in Traumatology and Orthopaedic Surgery (AEETO). 12. 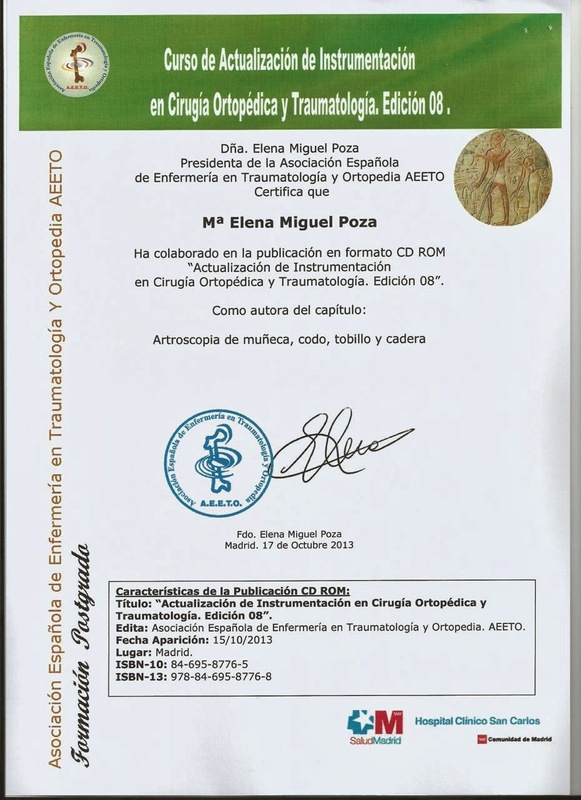 Publication certificate in the CD of VIII Update Course for Operating Room Nurses in Traumatology and Orthopaedic Surgery (AEETO). 13. 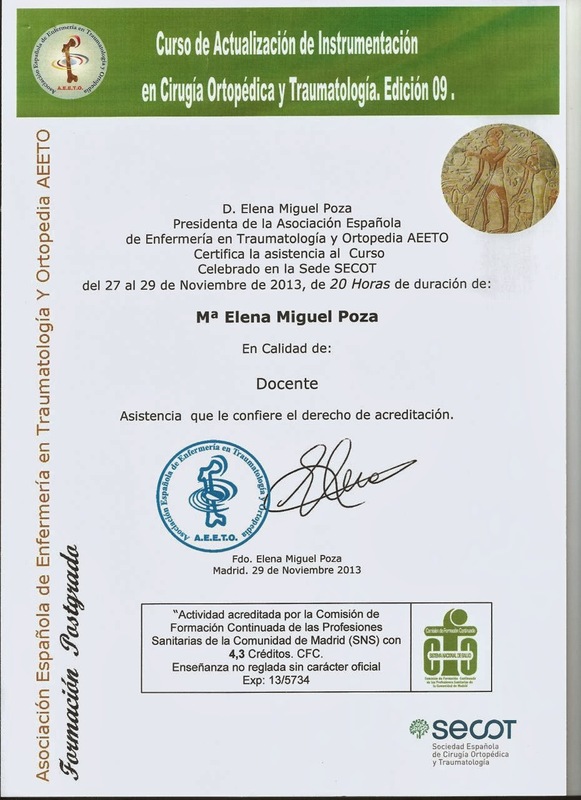 Teacher coordinator Certificate in the IX Update Course for Operating Room Nurses in Traumatology and Orthopaedic Surgery, in classroom training of SECOT organized by Spanish Traumatology and Orthopaedic Nursing Association- Asociación Española de Enfermeria en Traumatología y Ortopedia AEETO. 27th – 29th November 2013. 14. 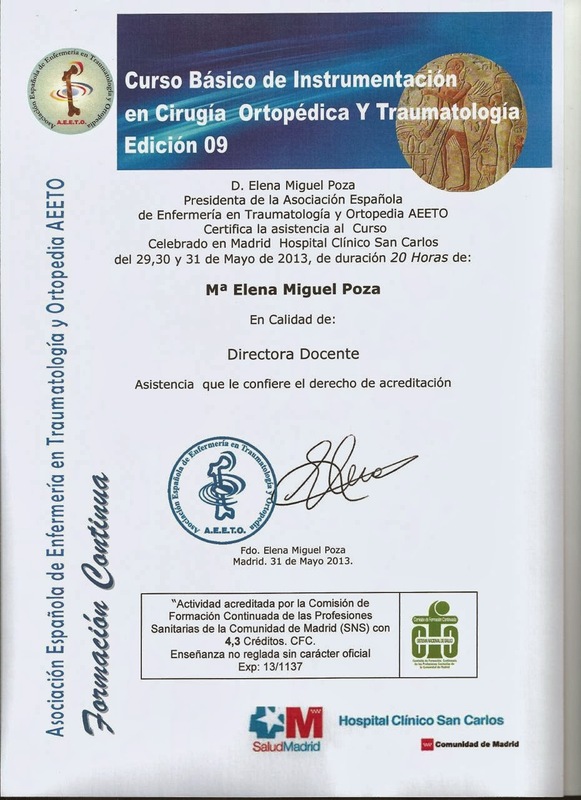 Teacher Certificate in the IX Update Course for Operating Room Nurses in Traumatology and Orthopaedic Surgery, in classroom training of SECOT organized by Spanish Traumatology and Orthopaedic Nursing Association- Asociación Española de Enfermeria en Traumatología y Ortopedia AEETO. 27th – 29th November 2013. 15. 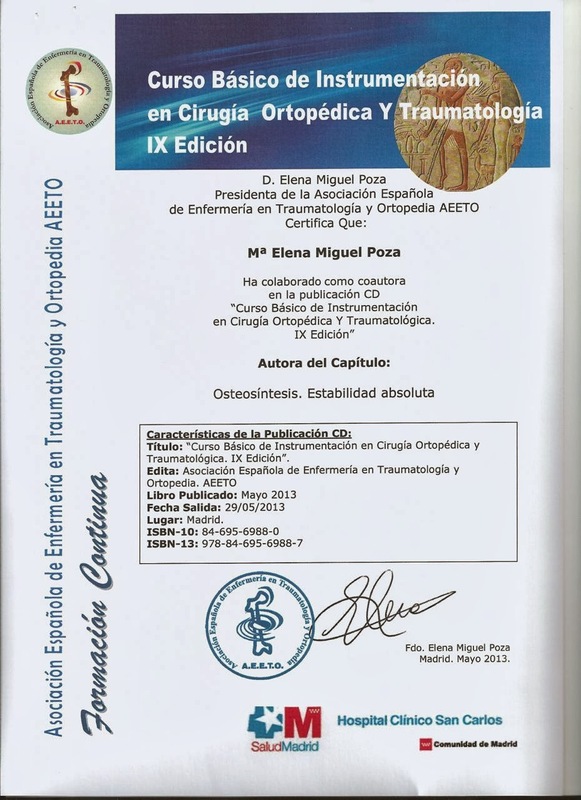 Publication certificate in the book of IX Update Course for Operating Room Nurses in Traumatology and Orthopaedic Surgery (AEETO). 16. 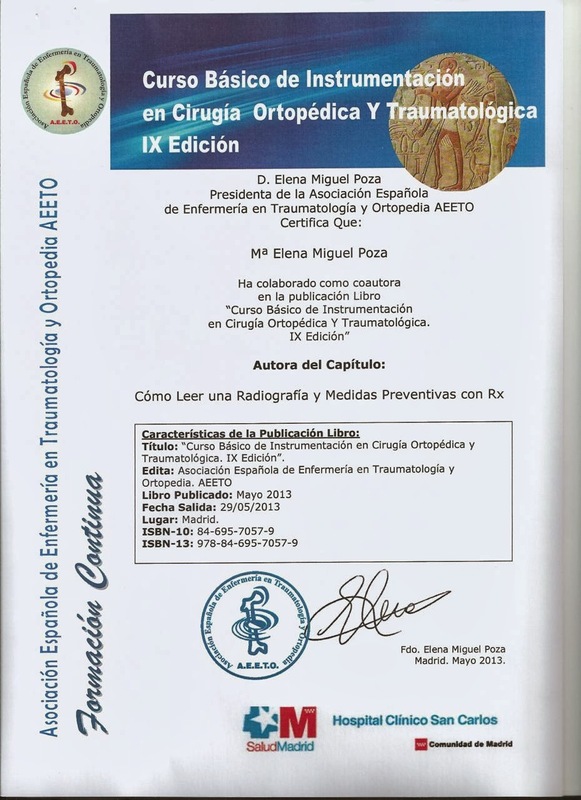 Publication certificate in the CD of IX Update Course for Operating Room Nurses in Traumatology and Orthopaedic Surgery (AEETO). My name is Elena Miguel Poza. 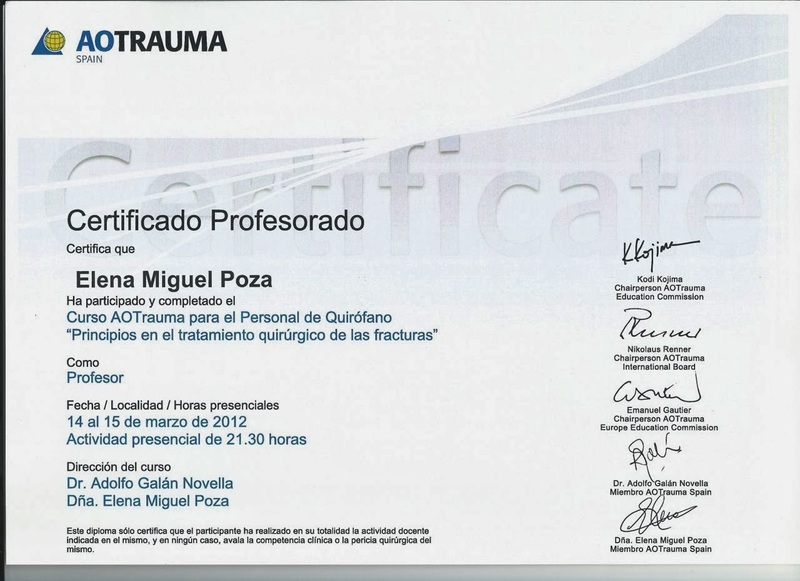 Since 1995 I have been the Nursing Coordinator in the Institute of Traumatology in Madrid. I have been teacher of various theoretical and practical courses for nurses since 1990 and I also organise nursing congresses and courses. 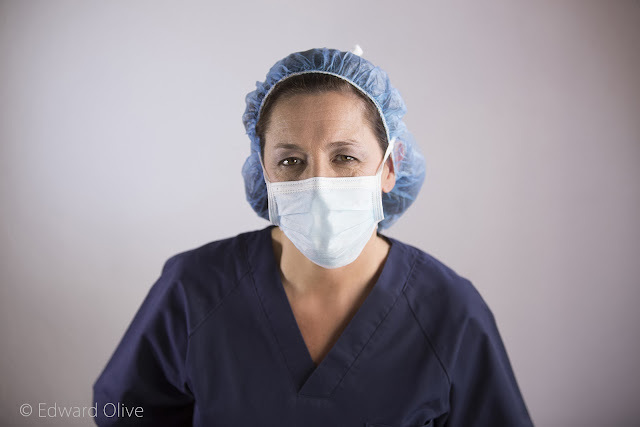 I have been a nurse from 1985 and I have worked in the Neurosurgery Ward (Hospital La Paz), the Accident & Emergency Department (Hospital de Mostoles and Hospital Moncloa) and Traumatology and Orthopaedic Operating Room (IMTRA - Institute of Traumatology in Madrid) from 1987. 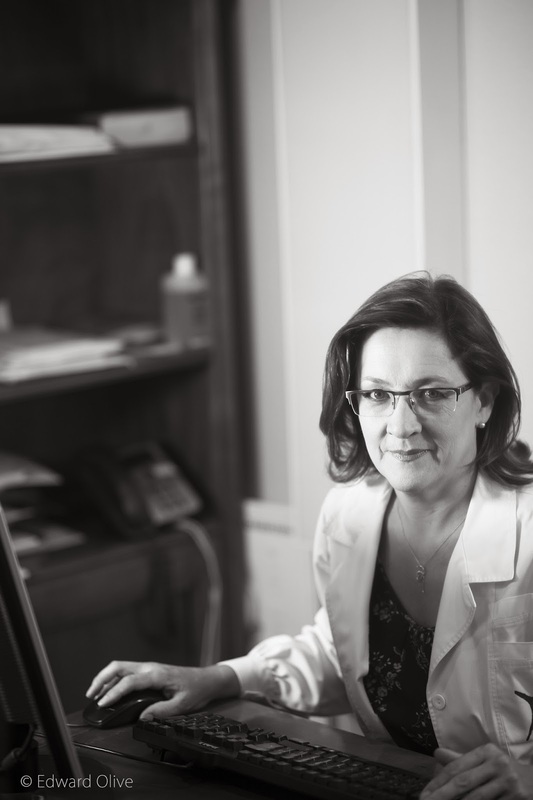 I am author of various professional publications (chapters of books and articles in nursing magazines). 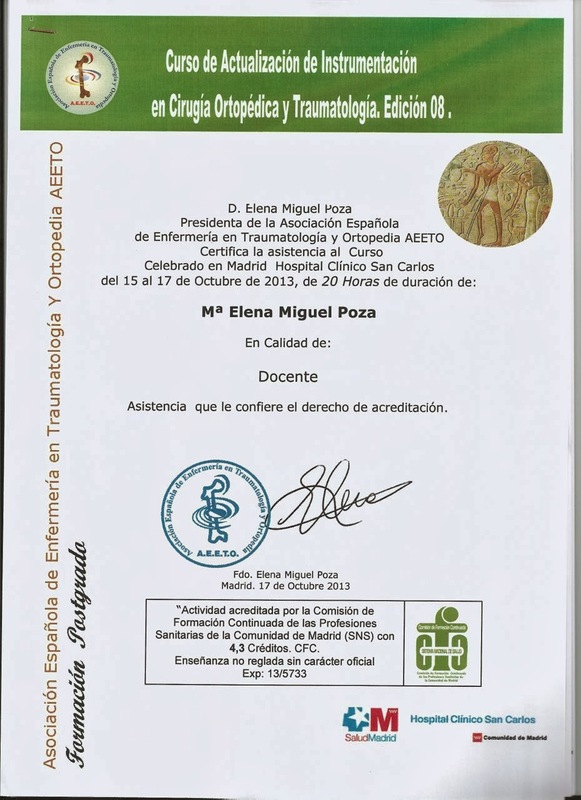 I have been AO Trauma ORP (Operating Room Personnel) Faculty from 2007 and I am the Spanish AO ORP Mentor from July 2008. Finally, I am President of the Spanish Traumatology and Orthopaedic Nursing Association (AEETO) from December of 2011. Copyright Maria Elena Miguel Poza. Nursing Coordinator Madrid Spain. Simple theme. Powered by Blogger.